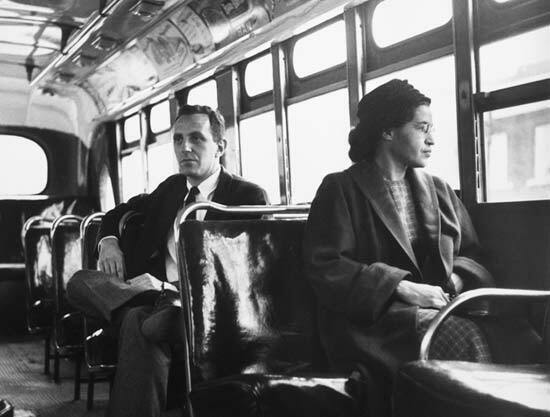 The blog civildisobedience 100 has reached its 100th post in 100 days — profiling Rosa Parks, the 42 year old African Amercian woman who sat at the front of the bus and became a leader in the civil rights movement. Remarkable, that such a “simple” gesture could take her from polite and oppressed follower to national leader. Remarkable to think how much courage it took to take that seat. Of her powerful and visible protest, Parks said, “I’d see the bus pass every day. But to me, that was a way of life; we had no choice but to accept what was the custom. The bus was among the first ways I realized there was a black world and a white world.”) http://www.thehenryford.org/exhibits/rosaparks/story.asp). Congratulations, civildisobedience100! Read more of these blogs — they’re a powerful testimony to civil disobedience across the globe and over the last century. Following up on yesterday’s blog about viral art movements and revolutionary leadership, this 100th blog seemed appropriate as a tribute both to the power of civil disobedience that creates courageous leaders out of invisible followers, and a testimony to the impact of the knowledge-sharing power of the blogging world.